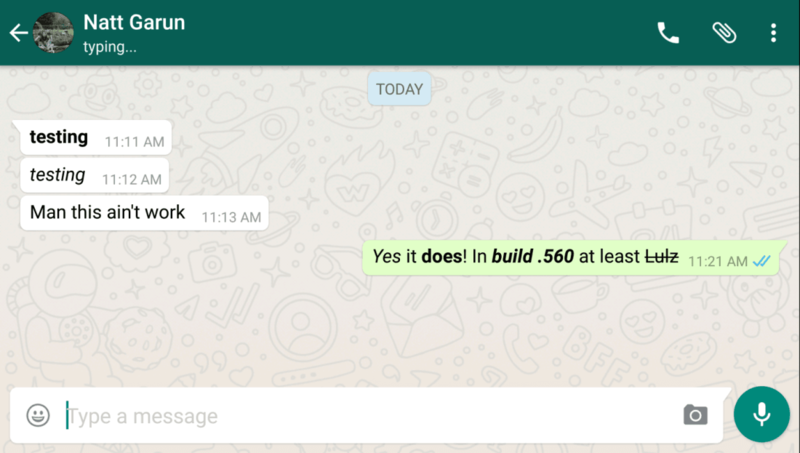 WhatsApp is rolling out a beta update today that adds a multitude of features to customize your messaging experience. Most noticeable is the Quick Reply feature that lets you respond straight from the notification. You can attach emoji or a voice message in the toolbar as well. Today’s update also lets you bold, strikethrough, or italicize text should you want to make your messages a little more snazzy. It works like the stylization tools previously available on WhatsApp’s Web client, just now ported over to the mobile versions. It’s a little more awkward to type via mobile, but an option if you absolutely need to add emphasis to your message. The same stylizations work for other messaging clients, such as Slack, so if you already know the trick, it should be easy to apply the change. You’ll also now be able to select a group chat thread or multiple contacts and hold for more options, such as muting, archiving, marking as unread, or leaving the group. Lastly, there are more custom wallpaper options added with this update, such as solid colors if you prefer something minimal. If you’re not seeing today’s update, try the APK for Android here.